Passion fruit, ahh! Passion fruit brings back happy memories of holidays spent at my father’s place in the countryside. Swinging in the warm summer breeze. Chasing butterflies dancing from flower to flower. Playing on pyramids of hay. Drenching in the monsoon rain and splashing puddles. Swimming in the pond. Enjoying fresh fruits from my grandparent’s home garden — mango, cashew fruit, guava, passion fruit, rose apple, jackfruit. And, plenty more. I have very vague memories of enjoying this beautifully sweet and tangy, aromatic fruit during my visits there as a young girl. It's a shame that we don't get to enjoy this fruit often anymore. You see, passion fruit is a delicacy in Qatar, and it's a rare chance to come across this fruit in the local stores here. So when I saw a stack of boxes in a supermarket last week, I was overly delighted. There was no chance I was going to miss this gorgeous fruit just because of a heft price tag, I thought. Bonus? I was even more delighted to see my kids experience this new fruit when I made a simple, creamy, dreamy pud using passion fruit and Alphonso mangoes – a quite sensational pairing. I found the inspiration for this delicious pudding in one of the amazing food magazines, Good Food, and adapted it slightly to suit our taste. 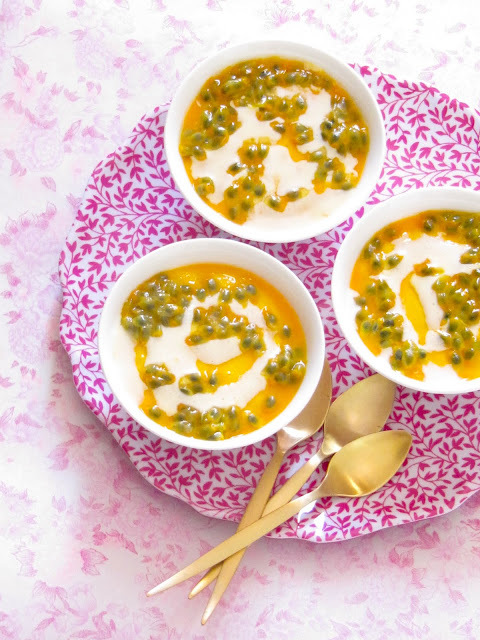 I love puddings like this—gorgeous to eat, glamorous to look at, and with a recipe that can be pulled together in next to no time. What better way to end a meal in this warm weather? I loved the ease with which I could make them and my folks loved how delicious it tasted—an absolute winner, without doubt! Every bit of this exotic pud is filled with aromatic ingredients. 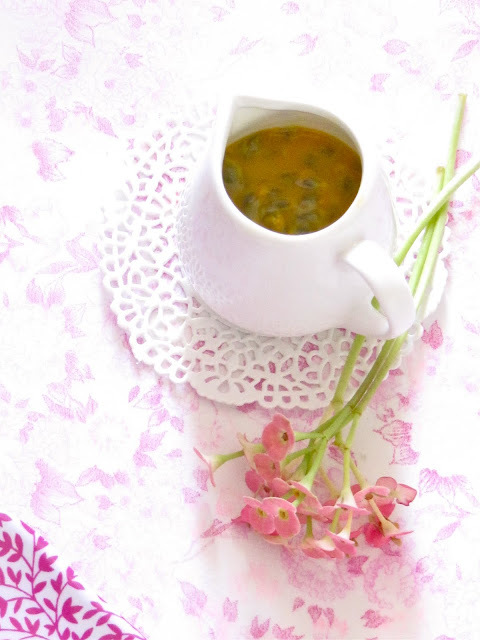 From the piney sweet cardamoms and juicy mangoes to the enticingly fragrant passion fruit. Though a rich dessert, it feels quite light from the fruitiness. Try it if you love yummy bites of sweetness full of beautiful fragrance and a hint of tang. We cleaned the dishes to the last bite. Call it a weakness, or my sweet tooth, but whenever I make delicious desserts, I can’t stop myself from clicking a whole lot of pictures to prattle on about the beauty of the treat to the world. After taking scads of photos of the lovely pud, I seriously lost it. I just couldn’t figure out which ones were good enough to be published…er, lemme rephrase, if any of them was good enough to be published—duh! So I’ve cramped this space with plenty of images. Again. Pardon me. Now for the even more difficult task: submitting photos to TasteSpotting (TS) and FoodGawker (FG). Oh heck, I can’t for the life of me decide on just a single photograph from the tons of shots I have. It’s kinda ironic that the images I consider worthy of TS or FG gets declined and the ones that are just passable gets published! I’ve had more success with FG than TS lately—bummer. And sadly, I haven’t had the time or patience to try my luck with a different photo. 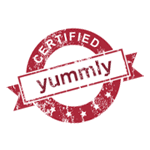 I admit I’m a newbie with such food sites but even with my nada experience, I realize that any photo should fit into the square display window of these sites. And since original photos are never square and I personally don't shoot with a square crop in mind, fitting a portrait or landscape shot nicely into a 250×250 pixel square frame is, at least to me, a great challenge. Especially if it's a tight shot. To cut the crap, since I consider TS or FS as my yardstick for visually attractive pictures, and with an aim to be a better food photographer, I have eons to learn. I know. Before I go to the recipe, let me quickly share with you another exciting new for Plateful. Have you heard of Season with Spice? Season with Spices is one of those delicious food sites featuring a mouthwatering gallery of food photos and recipes submitted by various incredible food bloggers from across the globe. I came upon this lovely website quite recently and I was instantly attracted by its unique concept of publishing photos of recipes solely featuring spices. The vibrant color and subtle fragrance of spice shines from every page of the site bringing into your kitchen not only an inspiring collection of indulgent recipes but also lots of information on spices. So when the lovely creators of this pioneer project, Reese and Mark, asked me if I’d like to be a featured blogger on the New Spice Route, I was pretty excited. As you may notice, Plateful offers a predominant collection of authentic Kerala dishes among other recipes, and as such will be representing the cuisine of Kerala, India, on the spice map. If you enjoy the taste and aroma of dishes seasoned with spices, or use spices for flavoring your food, then, this site is yours. Dash over to Season with Spice to discover new dishes with spicy ingredients, or share your own recipes. Many thanks to Reese and Mark, for giving me this opportunity. Using a mortar and pestle, grind the cardamom seeds to a powder; set aside. 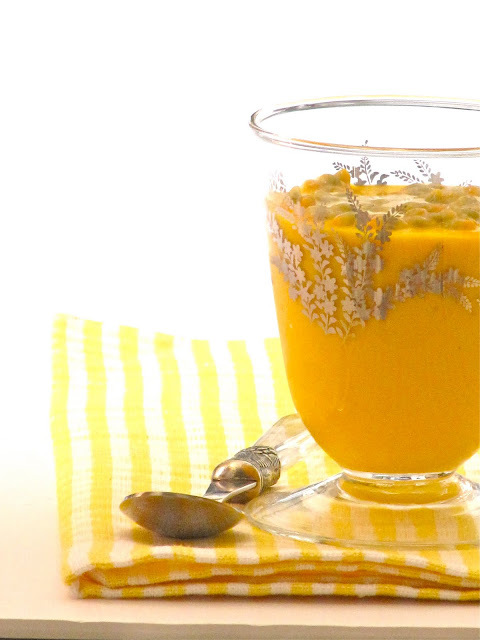 In a food processor, blend the chopped mangoes to a puree. Tip in the ice cream, thick cream, powdered cardamom and sugar (if using) and whizz again to blend. 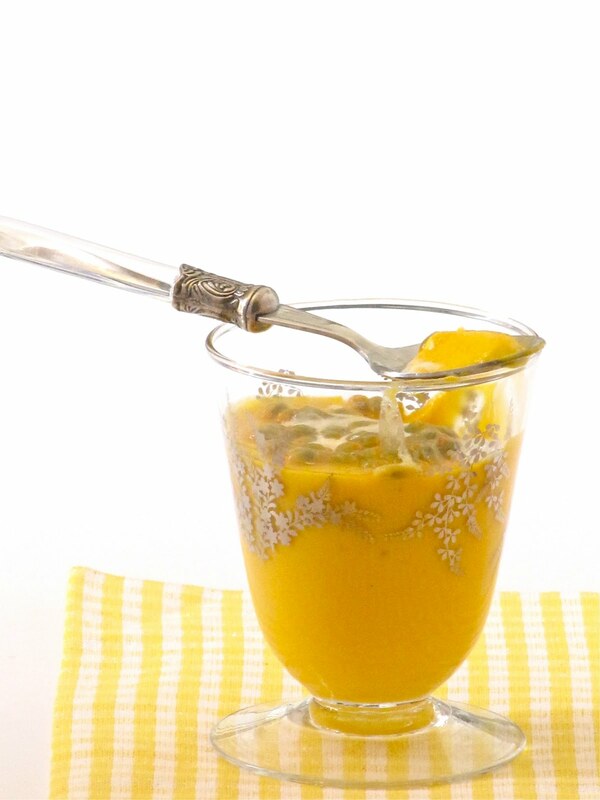 Spoon into small bowls, cups or glasses. Arrange the bowls (or whatever you are using) on a tray and chill for 30 minutes. 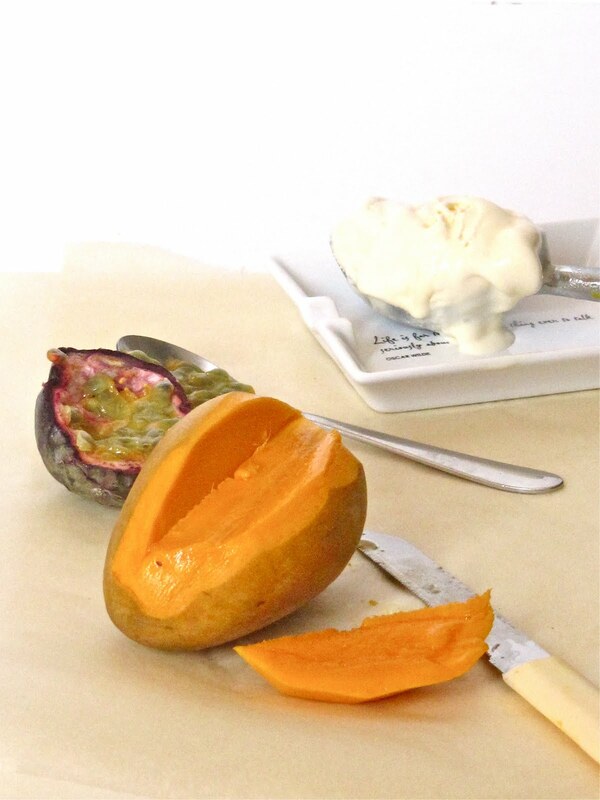 To serve, scoop the seedy pulp of the passion fruit liberally over each pudding. Drizzle a bit of melted ice cream on top, if you like. If you would rather make this a day ahead, like I did, make the puds without the topping and stash them in the fridge covered with a cling film. Top with the seeds of passion fruit close to serving. It is no sham…..this pud rocks! Super easy to make even easier to enjoy. love ur dishes...n this one looks super yummmm..! 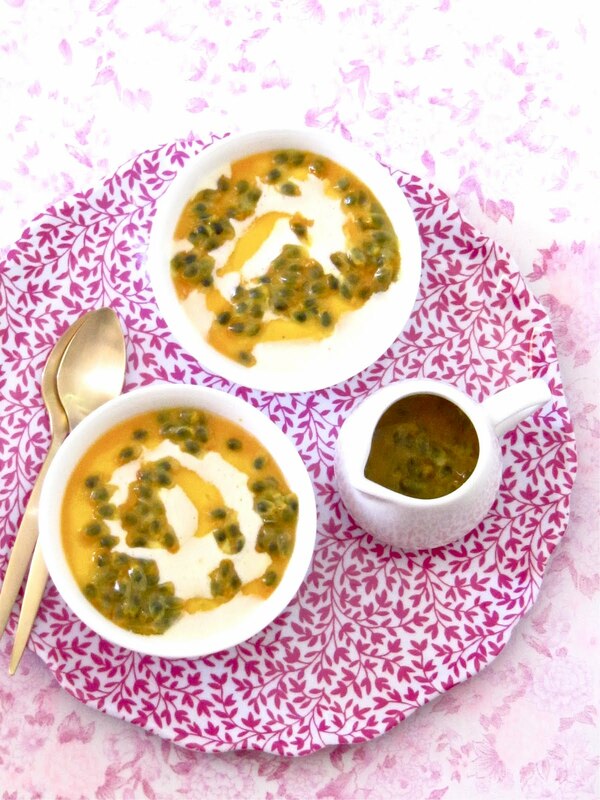 Nice recipe with mango and passion fruit combo! loved your clicks! Thank you, Jay, Raji, Deepa. You girls are so sweet..! Hey Prathiba, thanks so much dearie! Thank you Nash for linking this gorgeous pudding with Any One Can Cook. And yeah submitting pics with FG and TS is bit painstaking when we have lot, me too mad about about these food sites, submitting pics etc... Also congrats on being a featured blogger. 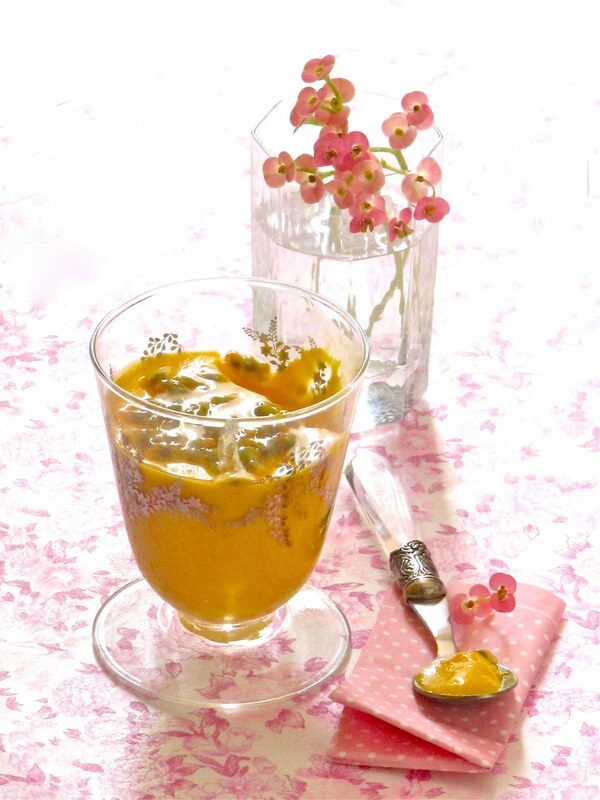 Finally I'll finish with one, you can submit this recipe to Nestle Mango Mania, you'll win for sure. 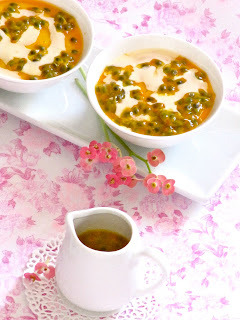 Excellent pudding dear,love both flavors and the combo will surely be a hit..looks absolutely delicious..beautiful clicks. Nice and delicious pudding !! Awesome pudding.. adorable pics as usual..
*OMG, you submitted this post to my blog :D sorry about the typo. Way to go, gal!!!! With such amazing talent as yours, it would have been a cinch to pick you!!! And I love the dessert and the pics for this one too! Oh woooow ..... the pictures are awesome. Such a fresh n delicious puddding. It is so true food always brings us childhood memories. 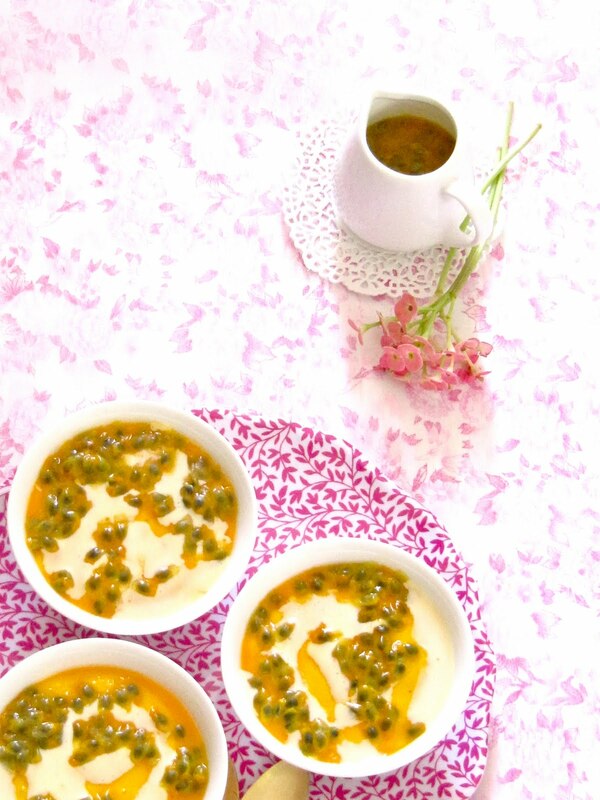 congrats on the featuring Nash:) wish to taste delicious pudding, looking at the stunning pic..Awesome! 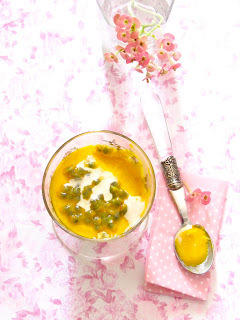 super delicious pudding..awesome clicks..lovely recipe..
Congrats on being featured in Season with Spice...That's really GREAT news..
Mango passion fruit pudding looks stunning..feel like tasting some now..and loved the pics..they are simply amazing..kudos for ur photography dear..mind blowing..
Omg, seriously i cant take my eyes from those wonderful click, pudding looks stunning,exotic and elegant..
Lovely pudding, but I can't find passion fruit. 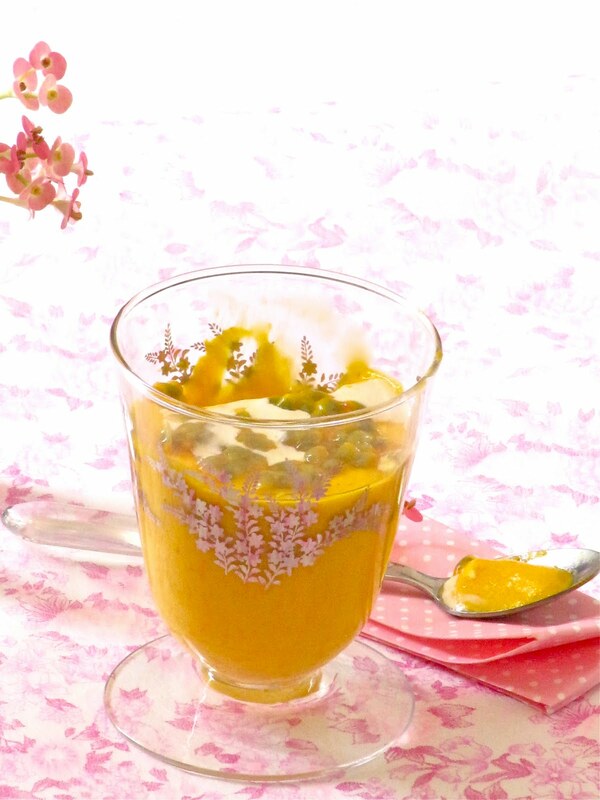 Nice use of the summer fruit 'the mango'. To top it your picture are breathtaking. You've got some serious photography talent (alternate profession maybe :) Congratulations on your pictures being recognized. Wow! I can't take my eyes off...Awesome pudding! 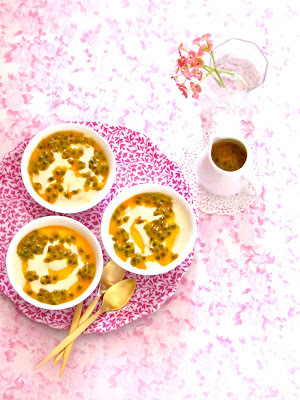 mango passion fruit pudding looks dleicious, nice clicks. Tempting clicks and looks so yum! 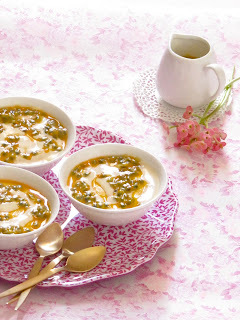 Superb clicks....and a totaly new recipe. Congrats on your achievements dear! Your clicks are amazing so does this fantastic pudding! Do you mind sharing a post about photography! Oh My dear,you dont know how much i love your awesome photography..can you tell me a bit about your camera brand ?? Thats a wonderful, delectable dessert!!!! 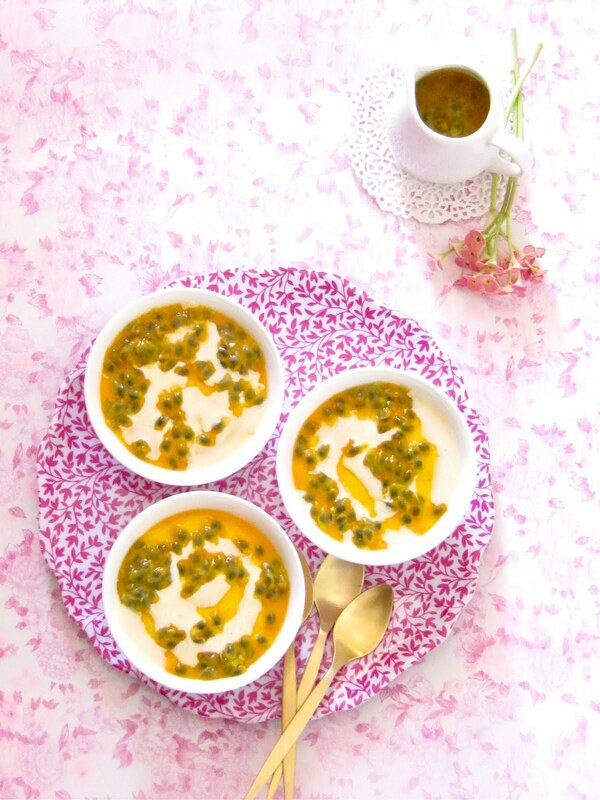 Congrats on your achievement.I too am a big fan of Passion fruit and your pudding is looks so wonderful.I am bookmarking this for when I will find some passion fruit.You are right when you asked if I am from Thrissur. 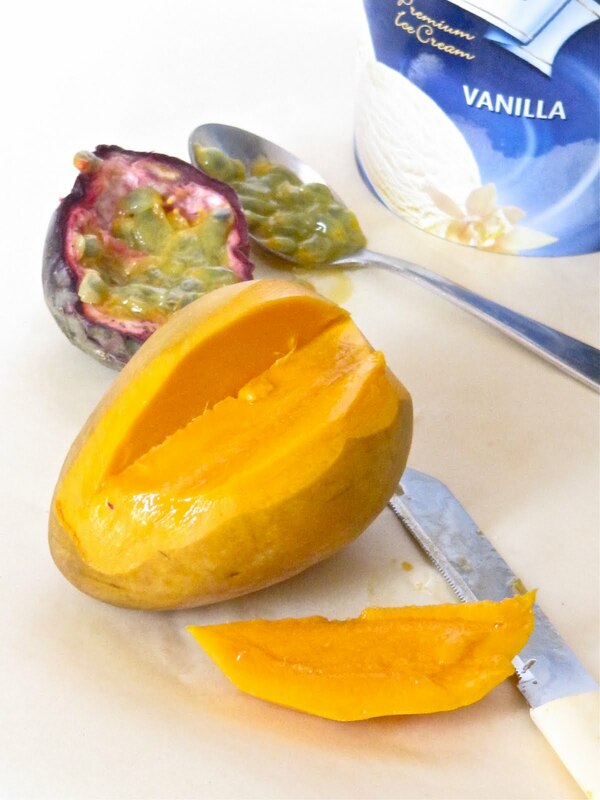 Passion fruit is one of my favorite flavors. The only time I have ever bought the fruit was when my husband and I were on our honeymoon in Madiera. That had five or or six varieties. Thanks for all the helpful info. 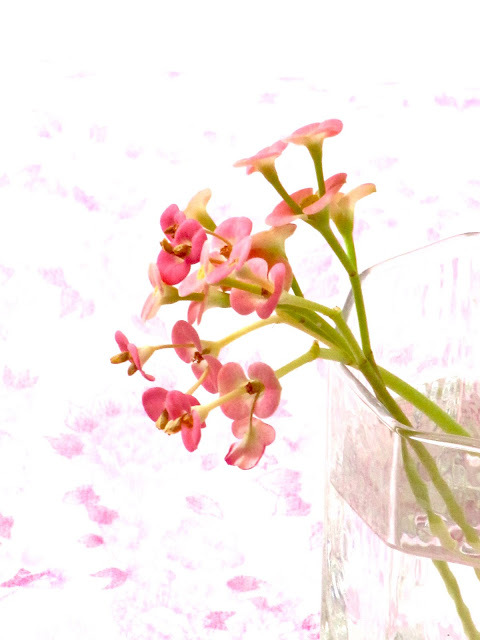 I am very much an amateur photographer but I always like your photos. And as of recently all of the wonderful summer dessert ideas! Pudding looks fabulous and yummy. Wonderful presentation. omg- what sensation pictures and stunning to say the least- each one surpasses the other and no doubt u were confused what to keep & what to ditch- as for the pudding it looks heavenly and congrats to be a part of the featured blogger in Season with spice ! Lovely and yummy pudding,looks so delicious and nice presentation. thank u for ur sweet comments! delicious pudding! !nice click too! im glad to follow u dear! super delicious!! !and loved ur clicks!!! Wow.. summer and pudding.. that is a welcome dessert dear :D Love it.. I love the aroma of passion fruit,,, Hmmmmm... Love your pudding! Thanks for sharing! 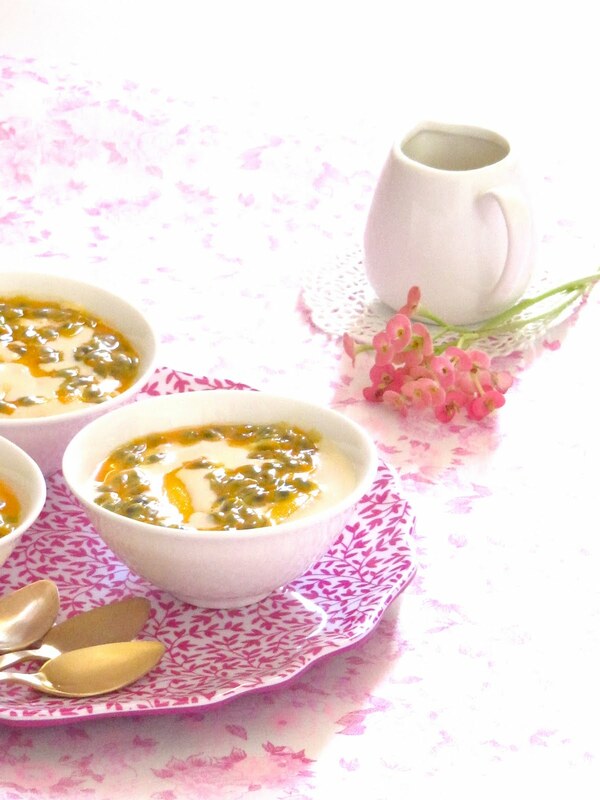 This looks so beautiful ...lovely summery pudding! My wife would love this dessert! what a quick refreshing treat! I have to say that your images are stunning, they should be in magazines, if TS or FG don't take them they are crazy!! Thanx for following and dropping ur sweet comments on my blog...glad 2 know u and ur talents here..Congrats on being featured in Season with Spice...That's really GREAT news.. It looks so exotic and so delicious! What divine puddings! I am a sucker for mangoes and passionfruits. What wonderful memories :) Your pictures are just gorgeous. Thanks for coming by and sharing your recipe. Have a great weekend. thanks for checking in on me :) I am back and posted today! This summer refresher has my mouth watering!! Super fruit combo! Te pictures are so so gorgeous I couldn't stop staring at it :) Such a pretty looking seasonal pudding. Why do I get a feeling that this pudding is going to be as gorgeous to taste as the apple jelly one. I made it again the day before for guests and it was such a hit. Its my go-to pudding whenever I want to impress. I have got to try this one too. Oh my gosh, you are all way too kind and sweet! Thank you, thank you so much everyone for the generous comments, the joy, and the smiles that you share with me. So glad to hear I’ve inspired you to try this pud. Hope you enjoy it as much as we did – keep me posted! Delicious looking pudding. Love the combo of mango and passion fruit. Awesome clicks.. I think I missed many of your wonderful posts. Didn't read them all through yet. Just ogled at the pics. I absolutely love that rasam. Keep rocking gal!! Assalam Alaikum,Can you please contact me via e-mail? i want to let you know about something good :) so please write me as soon as possible !! wow nash! 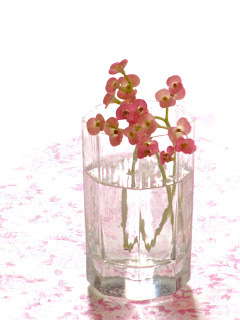 I just stumbled over your blog... Its soo good and the pictures are very creative. How do you manage to find flowers to co-ordinate your setting? Simply great!!!! We have all the ingredients, this is definitely tonight's dessert.